The Smock stitch creates a raised diamond pattern that will give an interesting texture to designs like pullovers and bags. Row 1 (Wrong Side): P3, *k2, p4,* rep from * to last 3 sts, p3. Row 2: K3, *sl 2, k4,* rep from * to last 3 sts, k3. Row 3: P3, *sl 2, p4,* rep from * to last 3 sts, p3. Row 4: K1, *sl next 2 sts on spare needle and leave at back, k1, k 2 off the spare needle, sl next stitch on spare needle, and leave at front, k2, k1 off spare needle,* repeat from * to last stitch, k1. Row 5: P6, *k2, p4,* rep from * to last 6 sts, p6. Row 6: K6, *sl 2, k4,* rep from * to last 6 sts, k6. Row 7: P6, *sl 2, p4,* rep from * to last 6 sts, p6. Row 8: K4, *sl next 2 sts on spare needle and leave at back, k1, k 2 off spare needle, sl next stitch on spare needle and leave at front, k2, k 1 off spare needle,* repeat from * to last 4 sts, k4. Share your photos to our Flickr Group, join us on Facebook, or check out our group on Ravelry. Probably a really silly question but I am a beginner and was wondering what you mean by right side and wrong side?? I bet the answer is so obvious and im being dumb!! The right side of your work would be the side that you ultimately want others to see when your project is finished. 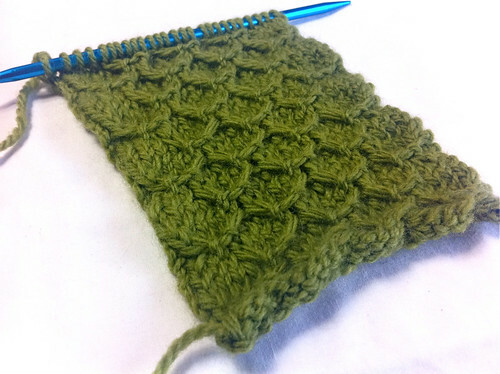 For example, when knitting stockinette, you have one side that is knit and one side that is purled. The knit side is nice and smooth and looks like rows of arrows pointing down. The purl side has a bunch of little bumps. The knit side would be the right side and the purl side would be the wrong side. If you were doing reverse stockinette, the right side would be the purl side. Hope that makes sense.